With the announcement in October of the Belgian government, regarding the choice of the American F-35A to replace our F-16A & B, we can say our Air Force entered a phase of big changes. This transfer will not be done in a couple of days, but the evolution has already well and truly started. 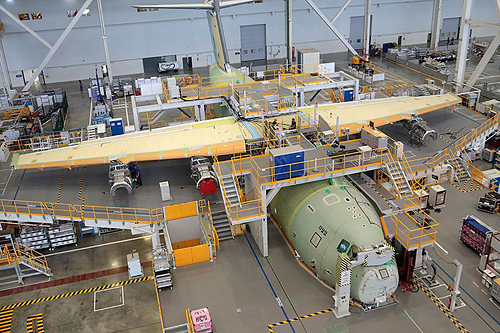 Indeed, the assembly of the first Airbus A400M for Belgium has started and the C-130H are sparingly leaving the bosom of the 20th Squadron. 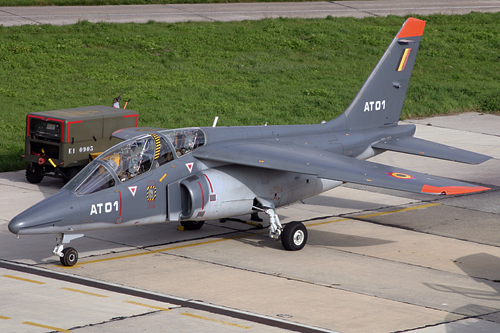 Belgium also left the AJeTS school at Cazaux during a discrete closing ceremony and part of the Alpha Jet fleet will be put up for sale. 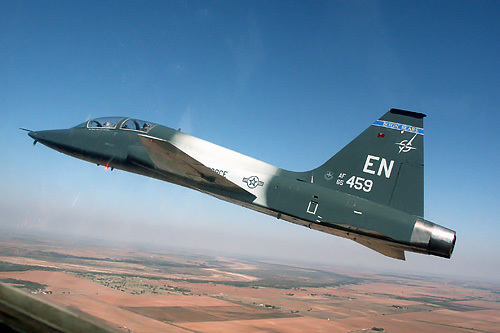 No replacement is foreseen, as the advanced training will be done under the ENJPT at Sheppard Air Force Base (USA). Within the frame of this change, it is noteworthy that, regarding the last information's, traditions of the 7th Squadron (Red Cocotte) will follow the move towards the American airbase, whereas the traditions of the 11th Squadron (Bat) will go the Control and Reporting Center (CRC) at Glons. The Seaking had its farewell tour and is being replaced by the NH-90 NFH for the SAR missions. The TTH on his side has showed its interoperability during several international deployments. (Serge Van Heertum ©) Some Belgian humor with this placard "For sale"! 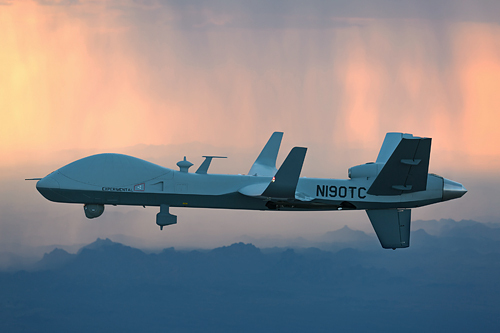 Of course, there is the announcement on October 25, confirming Belgium purchased 34 F-35A Lightning II fighters and MQ-9B Skyguardian drones, as the replacement of the IAI RQ-5 B Hunters of the 80th UAV Squadron. The step towards the 5th generation fighter is due to end in 2030, when all 34 contractual aircraft will be delivered. The first four are due in 2023 and the Air Force will benefit from a mixed F-16 & F-35 fleet for a few years before switching completely to Lightning II. A few days before his departure from the government, the Belgian Minister of Defense Steven Vandeput has specified the schedule of deliveries of the F-35A Lighting II chosen to form the new fighter jets fleet of the Belgian Air Force. The four first aircraft will be delivered in 2023 and as many in 2024, but the first eight planes will be based in Luke AFB, Arizona, to train Belgian pilots. The Belgian fleet will be integrated in the USAF's 56th Fighter Wing. 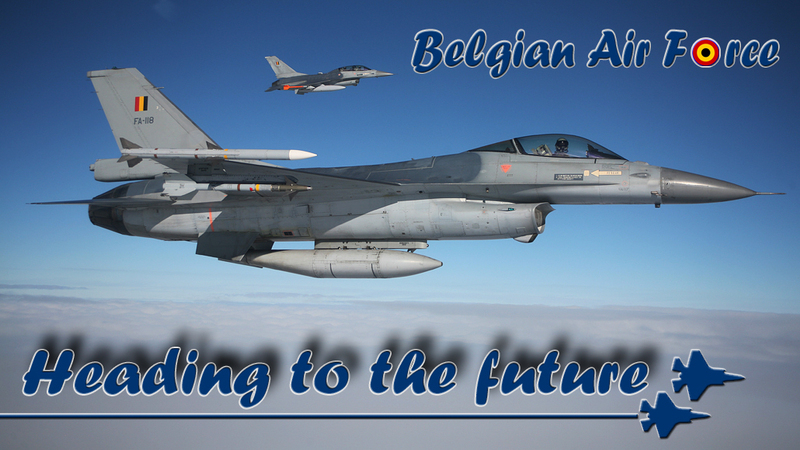 Between 2025 and 2027, four aircraft will be delivered annually to Belgium. Five aircraft will be delivered in 2028 and 2029 and the four last ship in 2030. Belgium has also joined the OCCAR (Joint Armament Cooperation Organization) program, which already includes the Netherlands, Luxembourg, Norway and Germany. 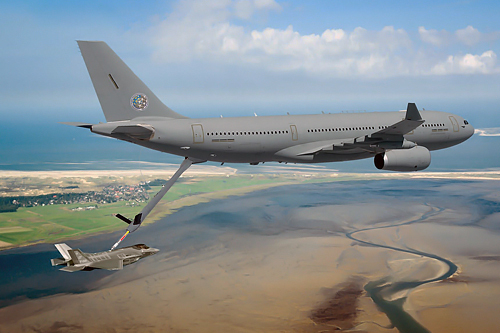 As a 5th participant, the governement will finance the purchase of a Multi Role Tanker Transport A330 MRTT. The tankers will be owned by NATO under a contract of exploitation. The European Defense Agency (EDA) initiated the Multinational Multi-Role Tanker Transport Fleet (MMF) program in 2012. The planned eight aircraft will be delivered between 2020 and 2024 and will be based in Eindhoven (Main Operative Base). ) or Cologne (Forward Operating Base). On basic training level, no changes are foreseen for the moment. The fleet of Siai Marchetti is kept flying, apart for some aircraft set in long term storage. Since little, there are Dutch student-pilots at Beauvechain, awaiting the completion the modernization of the Dutch PC-7 fleet by Pilatus at Stans-Buochs. The SF.260M is also the mount of the Belgian Aerobatic team "Red Devils"
Until further notice, the remaining fleet of Agusta A-109BA will be withheld. On the other hand, the future of the 21st Squadron is more than nebulous. The tendency to lease is indeed very present, instead of keeping the fleet. This is why one of the Embraer has already been taken off operations and the only and unique Dassault Falcon 900D will retire at the end of this year. If the tendency to lease is confirmed, the remaining of the Embraer fleet could be put up for sale in a near future. As we can see, the upcoming years will see a profound mutation of the structure of the Belgian Air Force. 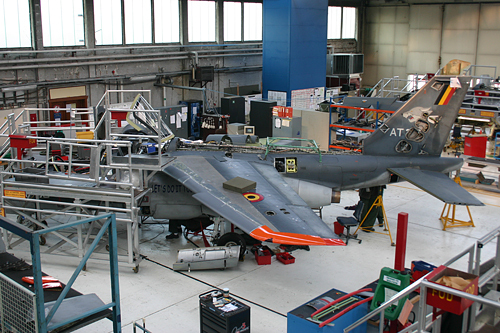 To complete this report, our collaborator Alain Debras, presents an overview of the last 14 years of the advanced training at Cazaux. On the other hand, it also seems appropriate to publish the "open letter" of Major General Avi Frederik Vansina, giving our readers an inside look at the future of the Air Force. This October 11th, 2018, a closing ceremony was held at Cazaux (France) at the Advanced Jet Training School (AJeTS). 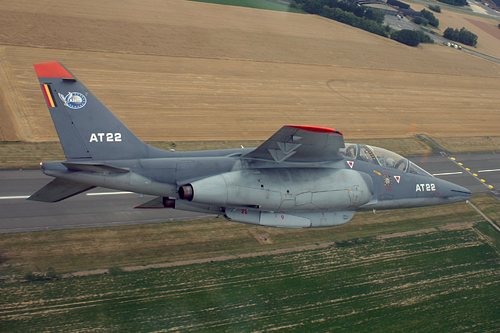 During 14 years, the French-Belgian school carried out the training of Belgian and French fighter pilots. Indeed, in 2004 a framework agreement was signed by the, then Ministers of Defence, Michèle Alliot-Marie and André Flahaut, creating the AJeTS by which the two armed forces decided to share their fighter pilot training assets. Made up of two succesive phases, the first based at Tours, equipped with French Alpha Jets and the second at Cazaux with French and Belgian Alpha Jets (the latter having previously been modernised). The 25 Belgian aircraft at the disposal of AJeTS, had received a mid-life update integrating modern avionics and navigation equipment, reducing the gap when moving on to F16, Mirage 2000 and Rafale. They will stay in the Gironde until the end of 2018 to fulfill the training needs of the French pilots and conclude the foreseen commitments. The Alpha Jets are due to be put up for sale during 2019 ; a flightsimulator also being part of the deal. In a little of over 50.000 flight hours, this school allowed the training of 165 Belgian and 215 French pilots. Some pilots of other European nations also went through these courses (Germany and Portugal), but the cooperation has not been expanded as initially hoped for. 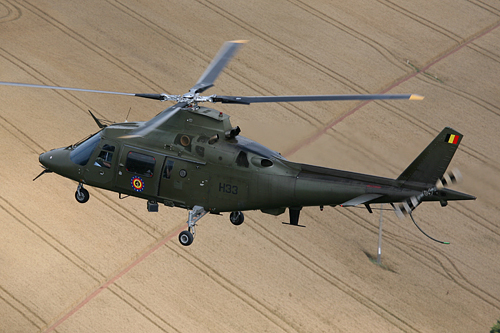 The closure of the AJeTS does not mean the end of the French-Belgian cooperation within the military aviation, as transport- and helicopter pilots of the two armed forces still will be trained, respectively at Avord and Dax. 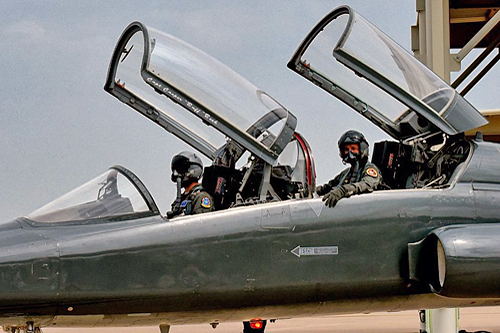 From now on, all Belgian fighter pilots will be trained at the Euro-NATO Joint Jet Pilot Training (ENJJPT) and the 80th Flying Training Wing, at Sheppard airbase, Texas - USA. Every year, this facility welcomes +/- 200 student pilots of all nationalities (from the 14 participating NATO member states) to fulfill their traning on Beechcraft T-6 Texan II and on to the Northrop T-38 Talon. Traning takes about 55 weeks and is ensured by instructor pilots of 14 nationalities (each nation sending student pilots is also held to provide for qualified instructor pilots). Allow me to address you in the language of aviation. The governmental decision yesterday to acquire 34 F-35 aircraft represents the culmination of the on-going transformation of our Belgian Air Force. I want to use this opportunity to pay tribute to Colonel Harry Van Pee and his ACCAP team, whose professionalism, perseverance and dedication have largely contributed to the success of the F-16 replacement endeavor. Looking into the not too distant future, our Air Force will comprise 2W and 10W flying the state-of-the-art F-35 Lightning II, 15W flying the impressive A-400M Atlas and hopefully the Long Range Jet and 1W flying the high-tech NH-90 Cayman helicopters. These core capabilities will be supported by a Squadron flying the MQ-9B Sky Guardian MALE, one Squadron flying the A-109 helicopter, a National Operations Center operating out of Beauvechain, an Air Traffic Control Centre which is synergistic with the Belgocontrol agency and a Meteo Wing which will be a national Centre of Excellence. A robust Force Protection capability spread over the different bases will safeguard operations at home and abroad and a PED-Center will Process, Exploit and Disseminate the networked information to national and international Command Centers. Our training Centers here and abroad will continue to deliver the highly skilled and qualified airmen and airwomen the Air Force needs. 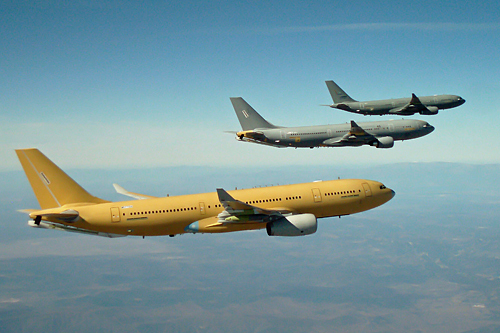 Our personnel will equally serve in the NATO E-3A Component and in the MMF Wing flying the A-330 MRTT Tanker/Transport. This government has held its promise and has recapitalized the Belgian Defences's Capabilities. The main priorities that will be fed into the next government will now be to obtain a structural increase of our country's defense spending and to continue to tackle our personnel shortage through different measures which should increase the attractivity of the military profession. The groundwork has been done by my generation but the job is far from over. Indeed, the fielding of all these new capabilities will require a great deal of work, dedication and equal perseverance. It will however be a positive flow to work on all these exiting new projects. That will be the responsibility of our future generations of leaders. Whether you are aircrew, a technician or a specialist in one of our many career fields, whether you are from the Northern, Centre or Southern part of our country, I count on each and every one of you to be united in order to contribute to the success of this huge challenge. You hold your future in your own hands and that future starts now. Thank you for your dedication which makes me proud to be your commander. Long live the Belgian Air Force.